Long black hair swinging from his helmet, 303-pound defensive lineman Mike Purcell -- not strong-armed quarterback Colin Kaepernick -- provided the highlight touchdown of the night for the San Francisco 49ers. 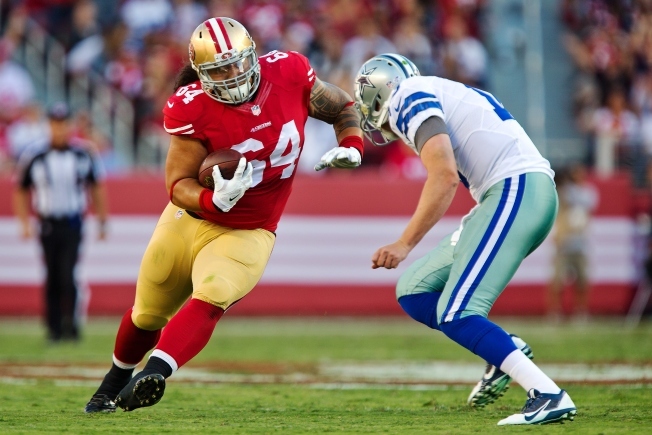 Purcell intercepted Dustin Vaughan's pass and returned it 37 yards for a touchdown to help the Niners beat the Dallas Cowboys 23-6 on Sunday night, his first TD since playing fullback in high school. "How about my man? Pick-6," coach Jim Tomsula said. Purcell, a practice-squad player in 2013 and for all but the final two games last season, followed up his six-tackle day last week in an opening loss at Houston. Dallas quarterback Tony Romo's day was done after one three-and-out series then the Cowboys turned to Brandon Weeden, who sustained a concussion. The Cowboys were expected to be cautious with Romo and Co. at Levi's Stadium, where the troublesome grass held up after causing concern for coach Jason Garrett and owner Jerry Jones -- who apologized afterward for criticisms of the grass before seeing it. Craig Dahl also added an interception for San Francisco against third-stringer Vaughan. Quinton Patton blocked a fourth-quarter punt by Tom Hornsey and scooped it up in the end zone for a 49ers touchdown. Dallas avoided a shutout when fourth-string QB Jameill Showers threw an 8-yard touchdown pass to Nick Harwell in the waning moments. Kaepernick's targets are still finding their way. Torrey Smith had the ball in his hands for a would-be 7-yard touchdown catch in the corner of the end zone before Corey White knocked it loose and the 49ers had to settle for a 25-yard field goal by Phil Dawson. Smith, overthrown by Kaepernick in the first preseason game, will have to come through when the games count. He faces huge expectations as one of San Francisco's biggest acquisitions under general manager Trent Baalke. He signed a five-year contract that includes $22 million in guaranteed money and could be worth as much as $40 million. 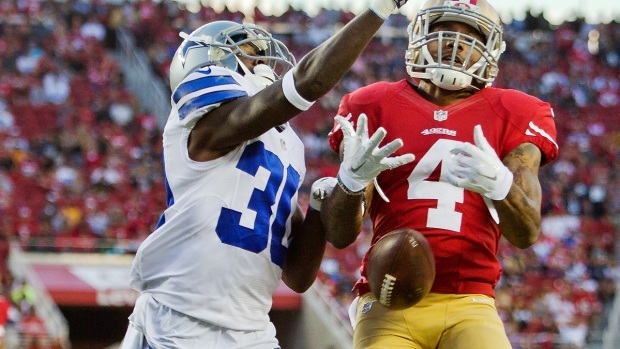 Randy Gregory sacked Kaepernick for a 14-yard loss on the quarterback's second and final series. Kaepernick was 2 for 5 for 13 yards. "That was the bright spot of the game. We were in some compromising positions on defense -- bad field position and scoring opportunities for them," Garrett said. "We kept them out of the end zone, had some timely sacks, and that was impressive." San Francisco linebacker NaVorro Bowman played for the first time since his devastating left knee injury in the NFC championship game in January 2014 at Seattle. He missed all of last year recovering from tears in the anterior cruciate and medial collateral ligaments in his knee, and he had surgery to repair the ACL. Bowman tackled Darren McFadden on the first play of the game after a 1-yard run, contributed to bring down McFadden the second play and had another following a 1-yard loss by Lance Dunbar on his catch from Romo. That was it for Bowman, and defensive lineman Darnell Dockett made his Niners debut. Tomsula planned to limit Bowman to five snaps. "He saw the long road that I've been down, that I've put the work in and it was just time for me to go out there and play," Bowman said. The Levi's Stadium turf business took a new twist. The 49ers used a different company, Evergreen Turf out of Chandler, Arizona, which supplies the NFC West rival Cardinals, for this particular field. It was re-sodded during the week following a pair of Taylor Swift concerts Aug. 14-15, then is scheduled to be at least partially redone following a concert by Luke Bryan next Saturday and again with a brand new field for San Francisco's Sept. 14 opener on Monday night. Youth players even got to scrimmage during halftime as the sod held up well. Jarryd Hayne sure looks to have the tools for the NFL despite the doubters. The rookie ex-Australian league rugby star added a 34-yard punt return to his stellar preseason debut a week earlier. He also ran two others back 23 and 27 yards and had eight carries for 54 yards. No. 38 might just stick when cut-down day comes. He has 258 total yards in two games. "I'm still a long way off from where I want to be," Hayne said. "I want to go into games confident that everything I do I'm comfortable with." McFadden carried three times for four yards and caught a pass for three yards. McFadden, who signed a two-year contract after seven seasons with the Oakland Raiders, was slowed by a hamstring injury early in training camp. "I'm just glad to be running around out there with my teammates and fighting with them," he said. "We didn't get the things accomplished that we wanted to accomplish."